Our hearts are utterly broken. This afternoon, we said goodbye to our sweet, 19-year old cat, Sammy. We were so very blessed to have him here with us for almost seven years. We always marveled at Sammy's ability to survive and keep on going. He was found in a feral cat colony, and ended up at PAWS when they rescued him from a kill shelter. 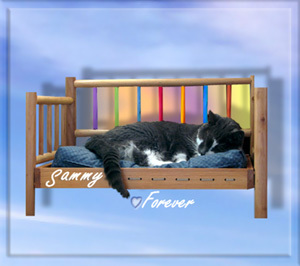 Sammy was the closest thing to a real-life Superman(cat) we've ever known. Nothing, it seemed, could stop him. Not a pellet in his leg (discovered years later during an x-ray). Not bartonella (diagnosed when we first adopted him). Not chronic anemia, kidney disease, a heart murmur, arthritis, or hyperthyroidism. None of these were a match for our Dootie. But with Sammy's health issues increasing (and Pancreatitis now in the mix) over the past few months, and with much greater speed over the past two weeks, we knew we might soon be faced with a most agonizing decision. After two days of watching him really struggle, and seeing a look in his eyes that told us he was tired of fighting, we knew it was time to say goodbye. Our compassionate veterinarian, Dr. L., and vet tech, M., came to our house, and our beloved Sammy slipped peacefully into eternal slumber in his favorite basket, with the mom and the dad petting and kissing him. There are so many things we will miss about you, our special boy. Your sweet and gentle, happy go lucky nature (we never, ever heard you hiss or growl ... not even once). The way you would let all those kittens jump on top of you during your time at PAWS. Your funny sounding meow. The way you covered your eyes whenever you slept. Your sweet and contented smile whenever you were sleeping. The way you curled up between the mom's legs every night. The way you would lick the dad's big toe, and rub your head-y on it (for whatever reason, you didn't like the mom's toe very much). The way you loved being brushed, and tried to take the brush and do it yourself. The way you would freeze your paw in mid-air while cleaning your face. The way you could still move pretty fast when food was involved (or your brofur Moosey made you mad). Seeing you slumbering in your hammock, or your wooden bed. And of course, the love, joy and laughter you brought into our home each and every day. There will never be another cat like you, Sammy. We love you always, sweet boy, and will see you when we get to the Rainbow Bridge. Wait for us, okay? Oh, we are very sad to hear about your sweet Sammy! We are sending purrs and love to you! I'm so sorry to hear about sweet Sammy's passing. He was so lucky to have been in your lives - I can't think of a better, more loving home. And I'm sure you feel very fortunate to have had him in your lives as well. Run free Sammy - so many of our beloved pets are waiting to welcome you at The Bridge! We are very sorry to hear about Sammy and are sending comforting purrs to all of you. Even when it is the right time to go, it is still hard to say goodbye to a kitty that makes such a pawprint on your heart. Oh, we're so sorry that Sammy has gone. We know you'll miss him so much. Pawhugs to all of you. I'm so terribly sad to read this news. I know he was blessed to have you as caretakers, as you were blessed to have his presence in your lives. But knowing that doesn't ease the grief, especially at this time. Please allow yourselves the time and space your grief needs, and know that so many of us around the CB understand what you're going through. The boys are sending soft purrs and I'm sending you all universal Light, wishing you peace in your hearts. I am really sadden to learn about the sudden loss of Sammy. He was a charming sweet mancat and he will be greatly missed. Gentle headbutts and soft purrs on your loss. Oh so sorry to hear about Sammy! :( He sounds like a true fighter and I know you were very lucky to be able to have him in your lives. Know that he's happy over the rainbow bridge free of any pain or suffering. My deepest sympathy for you. Oh, no! I am so sorry (and teary) about Sammy. How fortunate you were to have him with you these past years. And for him to have you and Moosey as his family. I know it was hard to say good-bye. Hugs! Oh, we are so sorry to hear this news about Sammy. Kevin and Tracey, we send you comforting purrs...Sammy was lucky to have you...and you him. RIP, sweet Sammy...you will be missed. I had just been thinking about Sammy, I guess because of Tulip's recent departure.I wondered how he was doing , so dropped by to see if there was any news. I am so sorry to hear that you had to say your final good-byes to your sweet, sweet, boy today. I so understand your heartache. What I wanted to tell you though, is that in the seven years you had Sammy, he experienced nineteen years of a charmed life. During those seven years, you gave him nineteen years worth of love , of feeling safe , being fed, sleeping in soft bedding,and feeling utterly cherished. Those seven years with you , erased the hardships he knew before you and his full, loving life with you became the summation of his entire life. You did that for him. And he knew that. It meant everything to him.He was loved. Well loved. Rest in peace sweet Sammy.We will miss you too. We are sending you all our love and hugs Tracey and Kevin. Sammy, my sweet furriend, dear little love of your mommy and daddy and Moosey. Mommy is very teary over your passing. She and I are shocked because we hoped you were much better after the scare we went though earlier. Sammy darling, fly free and swift..and I know that your sweet spirit will let itself be known to your family for a bit, so as to comfort them in this deep sadness at your passing. Admiral and many other babies are there and greeted you as you pased over thw Bridge and you are happy and content and playing and waiting for your family. You will be always vigilent, waiting and watching for them and you'll run as fast as the wind straight to them--right into their arms. All our love dear to you Sammy and to Mom Tracey, Dad Kevin and brofur Moosey. Sending you our most comforting purrs. Sammy was quite an amazing cat. Oh no :-(. I am so sorry that beautiful Sammy has gone to the bridge, I know you must be heartbroken!!!!! Sending all my love and sincere condolences. I am so very sorry to hear this. Many purrs to you today. We are leaky eyed and our hearts are breaking for you Kevin, Tracey and Moosey. Sammy was such a brave and strong boy as so many shelter kitties are, and yet so gentle, loving and sweet. oh we have vary vary leaky eyes - we are soooo sorry Sammy has gone to the Bridge. We knows that he will be waiting there for you 'cause you loved him so much. Our eyes are leaky and our hearts are heavy. We're so sorry that Sammy had to leave for the Bridge. You are in our thoughts, purrs and prayers. Oh no. We are so, so sorry to hear this. Our hearts break for you over the loss of your precious Sammy. We send you our gentlest purrs and surround you Dad Kevin, Mom Tracey and brofur Moosey with thoughts of love. What a beautiful post and tribute to your boy. Wow, what a special Mancat he was indeed and what a special love you have given him and such loving care you provided for him. Prayers and blessings to you all. Oh Kevin and Tracey, we are so sorry. We just saw this and feel so bad for you two. We sure sending tons of hugs and you will be in our thoughts for sure and prayers too. Sammy, glad we got to know you a little bit and we are so glad you had such a wonderful home for the last part of your life. Run Free. Sad to hear that sammy cross the rainbow bridge but I guess he will not be in peace. Rest in peace ! sammy. We are so very sorry for your loss. I'm sure I don't have the words to ease your heartbreak, but know I send my hugs and the boys send their purrs to try to ease it. Sending love to Sammy's family. We are so sorry that Sammy had to leave you and we send lots of gentle purrs and headbumps from us kitties and warm light from the human. Oh Kevin and Tracey - I cannot begin to describe the sadness I feel or the heaviness in my heart. But in the midst of that, I feel such love and strength in your words. Sammy was an amazing creature and how wonderful that you were able to share so many years with this incredible cat. Meows and purrs to you all from Deb, Dan, Zee, Zoey, Mia, Peanut, Rolz, Harley, and Kizmet. We are so terribly sad to read this news. He was blessed to have you as caretakers, as you were blessed to have his presence in your lives. May the memories of your love bring comfort at this time of sorrow. You were very brave to send Sammy Onward when you knew it was his time, even though it was very very hard for you. How better to make the leap into eternity than with your best people petting and kissing you? Our dear friend, we are so, so very sorry to hear about dear Sammy. Our hearts ache and our whiskers are all weepy wet. Sammy knew so much love and kindness with you and he returned it ten-fold. We send you all our love and hugs. One day your hearts will smile with loving memories of the life you shared. I'm so very sorry for your loss. What a sweet kitty he was. And 19, wow, what a long life! I'm so glad you filled it with love and care to the very end. Hugs and purrs from all of us. We are very sorry to hear the sad news about sweet Sammy. We are so sorry for your loss. We send you comforting hugs and purrs. We are so sorry for your loss. We feel stunned, as though we have lost one of our own and our hearts are broken. Sweet Sammy was a tough survivor, and thankfully he survived all the hardships in his life to become a member of your family. It was a miracle he came through with his angelic personality intact. How happy, lucky and contented he must have felt, and how thankful too. You gave him the best gift ever - your love. We hope in time your memories of him will be a consolation, until then hang tough, like Sammy would have done. We are purring and praying for you, and send our deepest condolences. Tracey and Kevin, Cody and I are devastated to hear about Sammy. Our hearts are breaking. Heaven just received a special blessing.....a precious new Angel. I'm so very sorry to hear that Sammy has gone to the bridge. This is such sad news. You took wonderful care of him and he'll be in your hearts forever. ohhh...our hearts are breaking and mommy's eyes are leaking. We know that no words can adequately express your pain, nor are there enough words in the universe to take it away. We are so very glad you had seven wonderful years filled with memories and we know you will cherish them forever. Sammy was a warrior, now he is an angel. I am sure he is in a happier food-abundant place. Hey Mr. K,we hope you, Moosey and Mom Tracey are okay. Our condolences. Oh we are so sad to hear of Sammy going to the Rainbow Bridge! Lots of love and hugs to you all!! My deepest condolences to you and your family on the loss of sweet Sammy. The story about him was very touching and brought tears to my eyes. RIP sweet boy. So very sorry to hear about Sammy. Mommy's eyes are leaking. We did not know your precious boy but wish we had. He seemed like a very special kitteh. RIP sweet Sammy. I don't know what to say. I am so very sorry to hear this. I know how much both of you loved Sammy. It is never easy to let go but not letting him suffer was the one last gift you gave him, however hard it was for you. Surrounding you both in love and light. This is such sad news. We send comforting vibes and purrayers for your loss. Sammy was well-loved, and you'll always have many good memories of your life together. Like so many others who have commented ahead of me, I am moved to tears reading the news, and the beautiful tribute you've shared. There just are no words that I've found that can adequately address the loss of a companion. Sammy was a SuperCat for sure, and reading his story is a reminder to all of us that despite life's setbacks, there's still a chance it will improve. And you'll land in a great home, with a great mom and dad and bro who will love you for the remainder of your earthly journey. Keep sharing Sammy with us, when your hearts are ready to bring forward his stories to help inspire humans to make a difference in the life or lives of felines. In the meantime, please be ever aware that your community is here to help you mourn. Sammy, be at peace little boy. And send your strength to all the ferals and shelter kitties who need a family like the one who was lucky enough to find you. We are so sad to hear your wonderful boy Sammy had to go to The Bridge. He lived a long life despite his illnesses and was obviously loved. We're sending purrs and hugs your way. He lives a very good long life I am sure!! Purrs and prayers to you!!! Oh No....., We all are so sorry to hear dat Sammy has left fur da Bridge. Da mom waz furry leaky eyed az she read da newz. With heavy heartz we send loud purrayerz to Ceiling Cat to send furry bright light to light Sammy'z way. We send soft kitty kissez and soft purrz to mom, dad & Moosey. We know you love(d) him greatly and well. I am so very sorry you had to say goodbye to your beloved Sammy. I love all that you loved about him, and I know he could not have found a better home than yours. I've always said that the way to know when "it's time" is to look into their eyes and just listen. You did exactly that, and he let you know. Purrs to you during this sad time. Oh Dears! Mommy and mes has leaking eyes! Sammy was such a stalwart guy! It takes a special cat to make us care so deeply and miss him so greatly. Wes is sending yous purrs of condolence and of strength and Live! It's so difficult to lose a baby. Luckily, Sammy lived a long life, and the last part of it was with you! We are sending positive thoughts, hugs and purrs at this time. Howls of sorrow over Sammy's need to leave us all. We understand this wonderful Warrior who fought for health was ready and know your decision was the hardest, most heart breaking gift of love you could have given...a release to peace and being pain-free. Feel our White Dog paws and human arms around you sharing the comfort of knowing that Sammy will be waiting when each of our time comes. We ask the Universe to grant you peace. Dear Kevin, Tracey and Moosey ~ I am so very sad and sorry. Sending you all love, and PURRS from Milo and Alfie. Thank you for loving him so much and giving him a wonderful life for as long as you could. I know how much this will be hurting you all. Thinking of you all. Oh, this is so sad. Purrs and headbutts from all of us. We are so sorry to hear of your sad news and send you many purrs and hugs. We are so, so sorry to hear about the passing of sweet Sammy. He was a very special boy, and he'll live on in the hearts of all who knew him. Many prayers, purrs and hugs. So sorry for the loss of your sweet Sammy. so so saddened by your news. A most moving and special tribute post. Thank you also for explaining 'the bridge' as we have often seen it mentioned but never knew its origins. we are very sad you have lost dear Sammy. It was time for him to go after giving such joy to his humans in his life. We think our Diamond and Sammy will be playing together at the Rainbow Bridge. Sending much love to all those who loved this sweet baby. I know that Sammy really enjoyed his time with you....probably the only really happy life that he knew after living on the streets. Take comfort in knowing you gave him this happy life. I'm so sorry he had to leave you. Run you and free again at the Bridge, Sammy. We are very sorry that Sammy has gone to the bridge. Our own kitty Totoro went there last year and we feel deeply your loss as well. Mom is having a hard time typing for us cause her eyes our so leaky. To Kevin and Tracey, you made Sammy the luckiest cat in the world when you saved him and loved him all these years. He was a strong kitty and his love will stay strong in your heart. To Moosey, we'd be happy to be your honorary brofurs cause we know your super sad too and we all needs brofurs to lean on. We are so very sorry to hear about precious Sammy. Please know you are in our thoughts and purrayers during this very sad time. Very sorry about Sammy. You gave him a great life and he was a happy boy. Oh no! 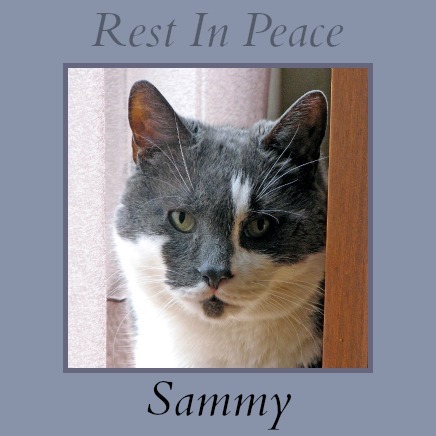 Mum has been out and we've only just read about Sammy going to Rainbow Bridge. We are so, so very sorry to hear this and know you will all be very sad. It is the kindest act when you decide to let your loving companion leave and travel forward to Rainbow Bridge and he will know you didn't do it lightly. He will always watch over you all from the Bridge safe in the knowledge that you loved him dearly. Sometimes when you least expect it you will be aware of a movement out the corner of your eye and that will be him coming to see that you are coping in his absence. I know how devasted you feel right now; but remember two of the greatest gifts we give are love and compassion; both of which you gave to sammy. We are so sorry to hear this sad news about Sammy. May your many happy memories bring comfort to you. My heart is broken for you. To release Sammy from his pain was your final, greatest gift. I know no words can fill the void left by Sammy, but I hope you can feel, in a small way, our love and prayers coming to you. We were heartbroken to hear about Sammy. We know he was very loved and we liked getting to know him through your posts. And this was a wonderful tribute to him - made at least one of us tear up. What a beautiful tribute to a special guy. You are all in our thoughts & prayers. He was special, as is your family. Much love & peace. We are so very sorry to hear the sad news about your precious Sammy. We are in shock and teary now... But we are glad that he got to spend last part of his life in a loving home with wonderful family. He was a real supermancat because we believe he had strong mind and also because of your support and love. We are saddened by the loss of Sammy. We are sending comforting purrs your way today. I write with tears in my eyes. Sammy was a special boy, and your tribute to him defines his role in your life with great love. Seems there were a lot of Supermen in that house. How lucky he was to have you both. His own people to take care of his myriad ills with super-hero can-do attitudes, love and grace. Not to mention big toes and legs to cuddle in. My heart goes out to you both for your loss. I am sure you know that you, his super-heroes, did the right thing for him. I am so very sorry about Sammy. He had a wonderful life with you and I'm sure he fought to stay with you as long as he could. You did the best thing for him by helping him go when he was tired of fighting. I am sure he is having a ball with all the other cats at the Rainbow Bridge. Kevin and Tracey, I am so sorry for your loss. Sammy is a very lucky boy to have had you as his mom and dad. He sounds like he was a very special kitty. I am so sorry to learn that sweet Sammy has left for the bridge. I know your heart is heavy and I will be sending good thoughts and purrs your way. Know now that forever he can run and play forever free. Some day you will meet again. Kevin and Tracey - we are so sorry Sammy has flown off to the Bridge. You gave him such a wonderful life and we know he appreciates it very much. He's now whole and well again, and having a wonderful time at the Bridge with our Angel furriends. I´m so so sad about the lost of Sammy. So sorry for your loss. Sammy was lucky to have you for his family and had a great life with you. My condolences on the loss of dear Sammy. What a hero, what a cat. I know your hearts will be broken, but remember your boy with great pride and Great JOY. So sorry for your loss of sweet Sammy :(. He had many wonderful years with you and will be waiting for you at the Rainbow Bridge. Soft purrs and comforting thoughts from all of us at The Lounge. We think that you gave Sammy a great life and a dignified passing, and we know he's missed greatly. I.m sorry to hear your sad news, RIP Sammy. My sympathies on the passing of your sweet boy Sammy. I am so so sorry to learn about Sammy going to the Rainbow Bridge. This is a beautiful tribute here and we can feel how much Sammy was loved and will be missed. I am glad that he loved his 7 last years with you. Sending lots of purrs (and hugs from the humans). He is running free of pain now, watching over you. We are so sorry to learn of your loss. It sounds like Sammy had a wonderful life full of love with you. We hope your good memories give peace to your hearts. So sorry to hear about Sammy. what a tough cat he was! And we're glad he finally ended up with you so that his last years were good ones. We're sending purrs and thinking of you. So very sorry about Sammy going to the bridge the tribute of his strength and spirit was very touching. Purring for your family at this time of loss. Just found out and I'm crushed for your loss. What an incredible life Sammy had. He touched the lives of many and he will missed. I'll be in touch privately but purrs for now from me and the boys. Kevin & Tracy, we are all so sorry to learn that you had to help Sammy on his way. To lose an old friend is so hard, even though it is the kindest gift to them when they have had enough of the fight. You gave Sammy a wonderful home, no cat could ask for better. Your tribute to him is beautiful, those sweet little quirks that made Sammy, Sammy will stay with you as warm memories when the pain subsides. Be kind to yourselves for as long as you need to. You are good cat people and the world needs more like you both. We send you love, hugs and many rumbly purrs. Oh sweet Sammy, you are now at peace. It sounds like you had a blessed life even with all your troubles. Your Mom and Dad gave you a terrific tribute. Hugs, Love, Purrs and Prayers for you Kevin and Tracy, it never gets easier for a loved furry friend who has passed. God Bless. Im really sorry for your loss Kevin. Im so glad you were with Sammy in the end. That is when they need us most. Sammy was a Handsome boy! I love the tribute you made for him. He was much loved and I know he knew this. Now he is at the Bridge playing with my boys that I still miss so much...Smudge, Mr.Man, Simba, Edgie and Whistie. They now have a new friend to play with. Sending lots of Purrs your way! Oh, how heartbreaking! I am so sorry for your loss. May God ease your pain and let the grief progress into fond and happy memories with your beloved Sammy. We are so very, very sorry for your loss. We are sending our loudest purrs to comfort you - and our Mummy Shimona also sends her love and prayers to ease your pain. Fly free, Sammy - One day, we shall all meet again in the Eternal Garden. We are so sorry for your loss. Purrs to you all. Mom is very sad to hear this, and hers cries for sweet Sammy, but hers also knows you will see him again. We know that there are so many kitties there to greet Sammy and keep him company. If you need anything at all, please e-mail the mom. Hers is here for anything at all. Please take good care of yourselves in this very difficult time, and please know that you are not alone. We only just heard of your loss and know the pain you are feeling. We are so sorry that you had to make the heart breaking decision to help Sammy on his way to the Bridge and send our deepest condolences. Stopped by to let you know I am thinking of you and knowing you are missing Sammy a lot. Know he is watching over all of you and forever at peace with old friends that were waiting for him. Keep Sammy close to you in your thoughts and heart, which I know you do. FURever Home Friday - Over the Moon!